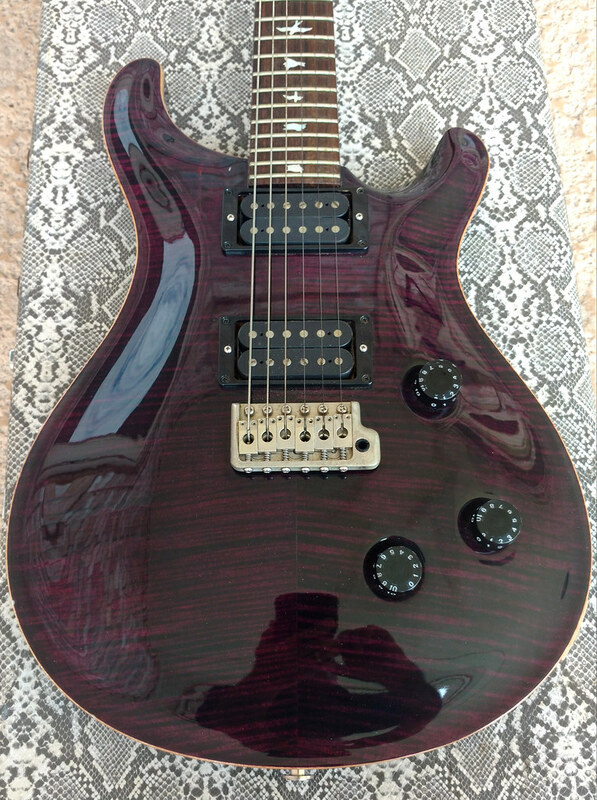 1995 PRS Purple Custom 24 10-Top Pawnshop Score!!! Making my rounds to today, and this one got in my way. It was way too good a deal for me to pass up, so I HAD to bring it home. No good guitars will left behind. This one has the wide thin neck which is a great fit for my hand. The pickups aren't the greatest pair, but I'm familiar with the Vintage Bass and HFS pickups. These are the same as I have in my '88 Goldtop Special. This baby should be good to go a good with some new strings, intonation, and string height setup. After that's all done, I'll be able to put it through it's paces. Here's some pics I took at the shop. I'm pretty happy scoring this one. The Purple is pretty awesome in person. 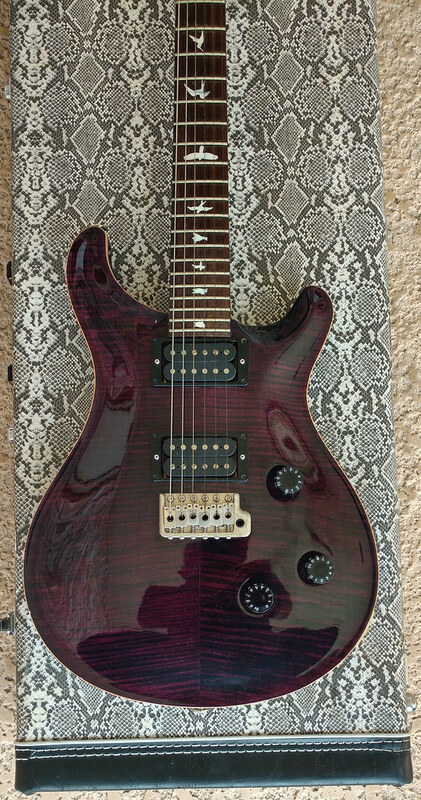 Yeah, thats my favorite older PRS color. Don't leave it in the sun! Is it really true about leaving it in the sun? I heard if you leave it in the sun the color will totally fade out. Stunner of a guitar. Did you get a good price on it? Yea I think it was a pretty good price. I paid $1000 for it. 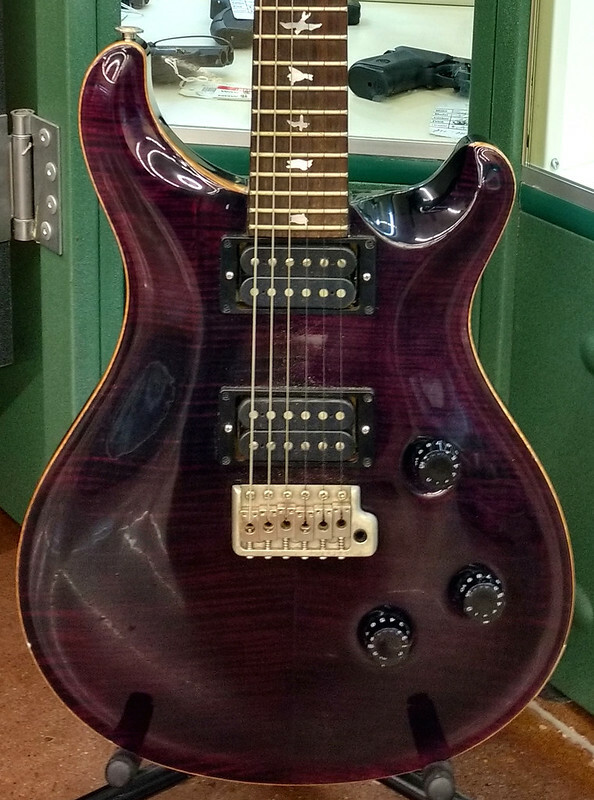 I figured the new '19 PRS SE Custom 24's go for between $800-$900, so paying 1k for this guitar was a deal for a vintage PRS with a 10 Top and Birds. Wanted to post some outdoor pics of the purple flame top to get a better idea of what it looks like. I agree, way nicer guitar! Pretty much totally faded to natural! I don't think I'd like the guitar as much if it lost all that pretty purple color. The sun just drained all the color out of that top. Wow, I thought that first faded to natural comment was a joke, but that really happened?! How is that even possible for a color to completely vanish? That's just SO hard to believe that all the color just faded. exposure to sunlight over the years? Actually I just picked this one up last week, going to do a thread on it here eventually. The shop it had been in had it hung way back in a store that was 1 side windows, the guitar got somewhat indirect sun at a certain time of day every day, and I do think it faded a bit more in the year or so it hung there. I've even seen them where people would hang their guitar in such a way it was partially shaded by something else in the room, but one part of the guitar got direct sun over a long period of time and it got a weird uneven fade. I keep this bass cased all the time when I'm not playing it, I like its fade as is. TBH I would think twice about playing it at an outdoor gig. Reds and Blues fade worst, I don't think I've ever seen a faded Vintage Yellow, but maybe I have and thought it was natural. Green seems to fade yellower and yellower, though, so I think yellow is the most colorfast of the original colors. Reds and Blues fade worst, I don't think I've ever seen a faded Vintage Yellow, but maybe I have and thought it was natural. Well I guess that does it. This guitar will only be let out for night gigs. No daytime festival or any outdoor gigs. Hopefully I can preserve the the original beautiful Purple color. 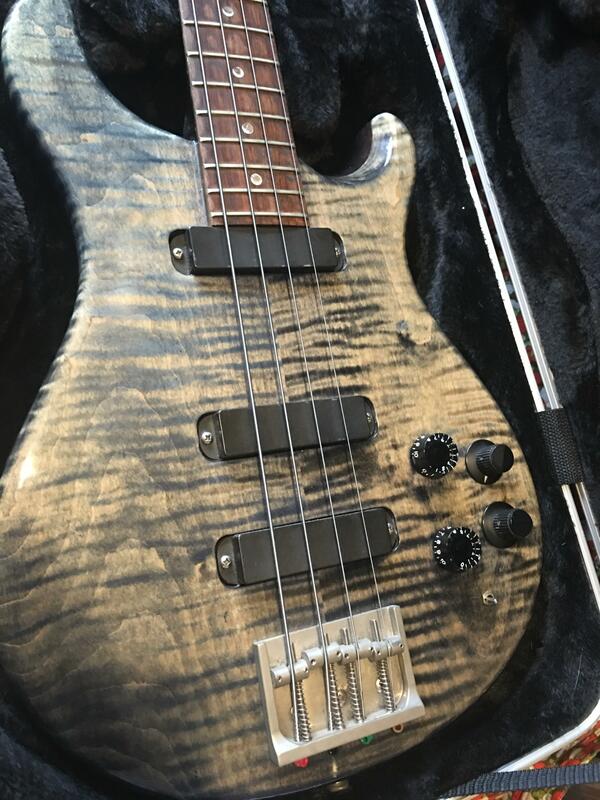 RH, I'm looking forward to the new thread featuring your new bass. What years does this fade affect? I have a 2009 Santana Anniversary in Angry Larry. It has spent the past couple years under all kinds of stage lights and sits on a wall hangar at home but shows no signs of fade. 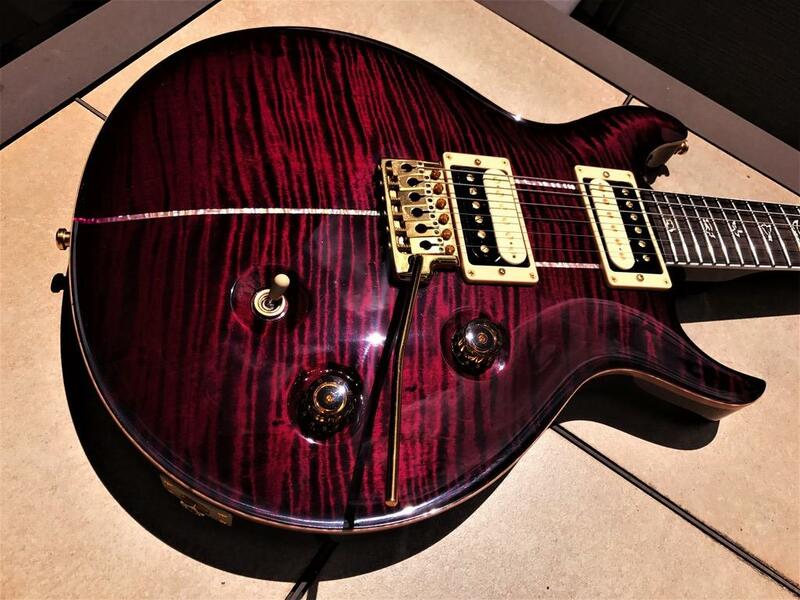 That Angry Larry is an amazing color for a killer guitar NotScott. The purple on mine is pretty rich, but the AL is just a filthy rich purple. Thanks. Angry Larry is a cool color. I really like your purple too. 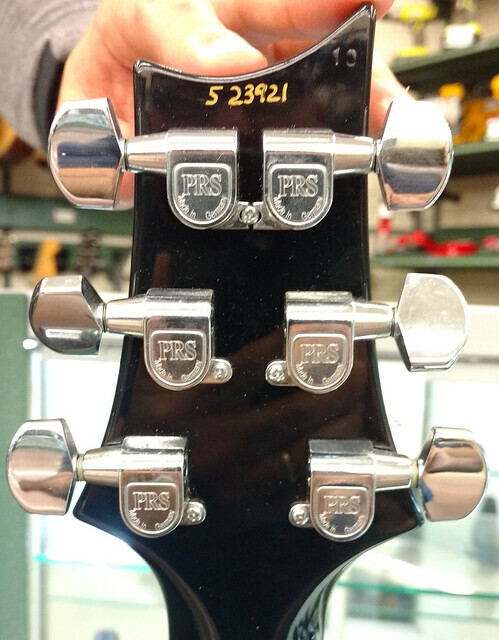 I was just curious if mine was susceptible to fade, as this is the first I have ever heard of PRS guitars fading.